The uphill struggle to persuade young children to eat their greens is one that has troubled parents since time immemorial. Desperate promises of ‘it’ll make your hair curl’ or ‘you’ll grow up big and strong like Popeye’ tend to be ignored. So what can you do to encourage your youngsters to eat their greens, take exercise and understand the value of a balanced lifestyle? Junk food is attractive to adults and children alike through its convenience, relatively low price point and heavy marketing. The sugars and salts it contains appeal to our bodies – they are things that we crave. When used as a treat or reward, it promotes an emotional attachment to that food, which the child will associate with good behaviour. Without it they will feel punished. It’s a potentially dangerous association to make. Instead, have junk food as an occasional part of an otherwise healthy diet. If it’s not in the house, it’s not a temptation, so clear it all from the pantry. The healthiest diet is nothing without a good amount of exercise. Our children today spend inordinate amounts of time sedentary; whether at their desk at school, in front of the TV or the computer. They are sophisticated little creatures. But you’ll be surprised how creative they can be when left to their own devices in a garden or a playground, especially with friends and siblings. Make an effort to incorporate outdoor activities into their weekly routine. Make this a reward – good behaviour and the family can go to the park; good grades earn a trip to the tennis courts etc. Ideally you’d start early with young children – pureeing your meals, refusing to cook separate meals and not promoting fussy eaters through bargaining or power struggles. If your toddler is a vegetable sleuth, then introduce vegetables into sauces, by cooking it all up and whizzing it in the blender. To satisfy sugar cravings, make fruit-based smoothies. Then gradually make the vegetables larger and start to educate them about the food they eat. The easiest way to get your kids healthy is to make them want to do so. Talk about what makes a healthy dinner, their favourite types of food and exercise. Learning the value of a balanced diet and how to cook it is an education your kids will be grateful for in later life. Cooking together will show them how easy and cheap a home cooked meal can be. Eating together makes a meal special and brings a family together. Children often don’t get enough water to sustain their busy lifestyles. They’ll naturally be attracted to the more sugary soft drinks, and that is ok for getting some liquid into them, but the amount of sugar or sugar alternatives such as aspartame can be damaging. Kids might think that water is boring, so put it in a pretty beaker or cool bottle. Ask them to drink 5 sips when you think they are thirsty, and if you’re right they’re bound to drink more. Sometimes they just don’t realise their thirst levels. Fundamentally, it is the responsibility of parents to demonstrate a sensible lifestyle that children will look up to and emulate. This means that you must practice what you preach. Each of the tips above are quite obvious, but we’re all guilty of letting ourselves slip into bad habits. The trick is to show children that you can have the odd treat as long as you maintain a balanced diet and exercise regime most of the time. Kirsten works for leading outdoor games specialist Letterbox.co.uk. She also has a young family of her own and encourages a healthy lifestyle, even if it is at times a battle! Now that my kids are teens it’s a little easier because they are willing to eat healthier but as little ones, yikes…it was hard. Great ideas I’ll pass on to my daughter to try on her son. Thanks for the tips it is so hard sometimes. I did a better job with my daughter. we talk about nutrition all the time. My son loves to be outside and I started him off as a whole foods, loving kiddo. 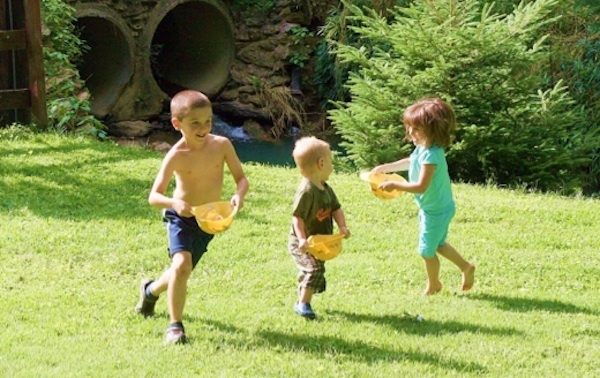 I need to put my kids outside more — they would play lapsers all the time if I let them. These are some great ideas. Thanks for posting. Great ideas! I’ve been making it a point to tell my kids to go run around the backyard for at least an hour a day. I think it’s important for kids to get outside and be active. Also, I’ve been making homemade popsicles with juice from fruits and veggies and they LOVE it. I really have to work on the last one – monkey see, monkey do. This monkey has some shaping up to do in putting health first this summer. Great tips! My son loves being outside and active! Great tips! We get outside whenever we can.